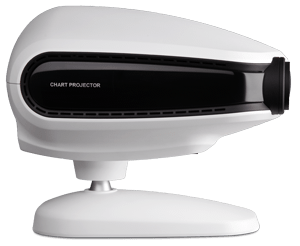 The OZMA CCP 9000 Visual Acuity Chart Projector offers accuracy and efficiency when performing visual tests while utilizing the total refraction system. Take advantage of this high quality product at an affordable price. Clear and fast, the CCP-9000 has a high resolution power of line to provide clean graphics and a fast chart changing speed. Provides brighter and clearer charts than conventional light bulbs. Can be used with any refraction system to provide fast and efficient vision tests. With 41 charts, such as Red/Green and polarizing filters, tests like the Binocular balance test, Stereo, Aniseikinia and Fusion tests are now conveniently performed.